All Awareness Jewelry net proceeds will be donated directly to the Stanford Comprehensive Cancer Center at the end of each year. 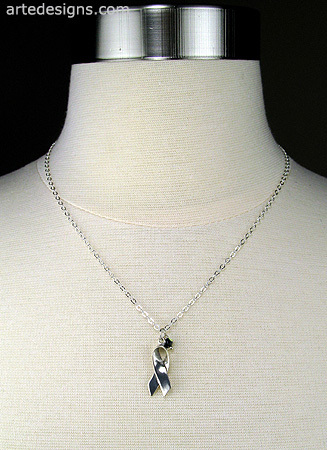 This classic sterling silver awareness necklace includes a 1 inch sterling silver awareness ribbon and a sparkling 4mm jet ab Swarovski crystal. Choose a 16, 18, or 20 inch sterling silver chain with a spring ring clasp. 100% of the Handmade Awareness Jewelry net proceeds will be donated to cancer research, education, and new treatments for Breast Cancer, Lung Cancer, Skin Cancer, Prostate Cancer, and much more. Together, we can help support the fight against cancer and also inspire hope and give support to those who are living with cancer and their loved ones. 100% of the Handmade Awareness Jewelry net proceeds will be donated to cancer research, education, and new treatments for Breast Cancer, Lung Cancer, Skin Cancer, Prostate Cancer, and much more. Awareness jewelry does not have to be extremely colorful and ornate to make a statement. These handmade awareness necklaces are simple and subtle, yet they are eye-catching and to the point.